On January 31, 2015, Serena Williams won the 2015 Australian Open defeating Maria Sharapova in straight sets, 6-3, 7-6 (5). 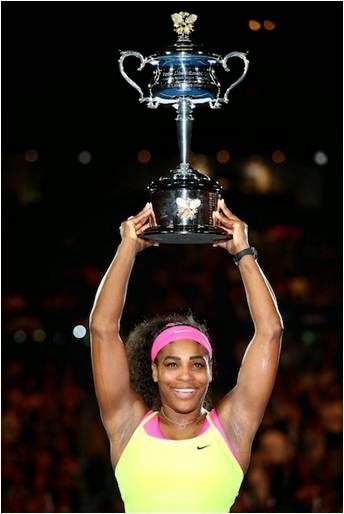 This victory is Serena's 19th major title and 6th Australian Open crown. Serena last won the Australian Open in 2010 after defending her 2009 title. After last night, Serena has won 16 straight matches against Maria, a streak that dates back over ten years to 2005. Maria's last win over Serena came in 2004 at the WTA Championship match; she is now 2-17 versus Serena. Maria dethroned Serena and won her first major at Wimbledon in 2004. After the match, Maria said, "Serena...I know there are gonna be so many more moments when we are gonna play and I'm sure we're gonna be here one more time and hopefully many more times at other Grand Slams and fight for the trophy. Thank you for giving me a tough match, but I am sorry I had to win today." Overall, Serena has a compiled a 19-4 record in Grand Slam Championship matches and a 3-1 record versus Maria in Grand Slam Championship matches (defeating Maria in the 2007 Australian Open final, the 2013 Roland Garros final, and the 2015 Australian Open final). After the competitive 2015 Australian Open final, Serena said, "growing up I wasn't the richest, but I had a rich family in spirit and support, and standing here with 19 championships is something I never thought would happen. I went on the courts with just a ball, a racquet and a hope. That's all I had. So all you guys who want to do something or be something, just never give up. You never know what can happen or who you can inspire. I'm just so honored."